Search.hyourtransitinfonowpop.com is the PUP that uses misleading techniques to prevent removal. Use Reimage to locate malicious components and get rid of them faster than with uninstall instructions. A full system scan blocks virus reappearance and prevents traffic to malicious domains. Search.hyourtransitinfonowpop.com is a fake search engine which can hijack Google Chrome, Internet Explorer, Mozilla Firefox, Safari or other browsers and modify its settings. This questionable application was developed by Polarity Technologies Ltd and is identical to Search.hmylocaltransit.co, Search.yourtransitinfonow.com, and many others. Typically, browser hijackers have a specific theme to be appealing to users. Even though the shady app infiltrated the PC unnoticed, some users might consider keeping it as it offers the supposed superior browsing experience. In this case, Your Transit Info Now provides multiple quick access buttons to all-things-transport: maps, local transit timings, weather forecast, news, etc. The main threat this dubious application poses is its rerouting tendencies. Your Transit Info Now hijack sets startup page to hxxp://search.hyourtransitinfonowpop.com/; thus, going back to your preferred browser becomes impossible. This seized search engine then redirects victims to questionable domains. You can end up on malware-ridden or phishing websites. stopping users from Search.hyourtransitinfonowpop.com removal. Although PUPs are typically not as big of a threat as other malware, security experts from Viirused warn that using such apps for a prolonged period might put user's privacy and computer at risk. So-called Search.hyourtransitinfonowpop.com virus might install third-party extensions that might spy on users, display malware-laden ads or redirect to phishing websites. Lastly, do not forget that browser hijackers collect a considerable amount of non-personally identifiable information. Every website you check, every search query you type, all the links you click – all this is being constantly monitored. The collected data is precious as it allows to promote sponsored content. Therefore, it is crucial not to click on any links after redirection. Just close down your browser, install a robust anti-virus program, like Reimage and perform a full system scan. This way, you will be able to removeSearch.hyourtransitinfonowpop.com and protect yourself from dangers the hijacker poses. Search.hyourtransitinfonowpop.com displays various unwanted adverts and causes several redirects. Finally, invest in robust security software and keep it up to date. You can remove Search.hyourtransitinfonowpop.com either by checking our detailed illustrated guide below or by downloading and installing a powerful anti-virus program. Both methods are viable; however, we do recommend the latter to simplify this procedure. After installing security software, update it and scan the system. Within a couple of minutes, the hijacker will be removed. For those who want to attempt Search.hyourtransitinfonowpop.com removal without security software, please follow the instructions attentively in order not to overlook any of hijacker-related entries. Remember, in case this procedure is executed incorrectly, the virus will return as soon as the browser is restarted. Here, look for Search.hyourtransitinfonowpop.com or any other recently installed suspicious programs. Wait until you see Applications folder and look for Search.hyourtransitinfonowpop.com or any other suspicious programs on it. Now right click on every of such entries and select Move to Trash. Reset Internet Explorer settings as soon as the threat is neutralized. When in the new window, check Delete personal settings and select Reset again to complete Search.hyourtransitinfonowpop.com removal. Once these steps are finished, Search.hyourtransitinfonowpop.com should be removed from your Microsoft Edge browser. Here, select Search.hyourtransitinfonowpop.com and other questionable plugins. Click Remove to delete these entries. Now you will see Reset Firefox to its default state message with Reset Firefox button. Click this button for several times and complete Search.hyourtransitinfonowpop.com removal. Uninstall Your Transit Info Now and other browser extensions that are created by Polarity Technologies or other shady developers. Here, select Search.hyourtransitinfonowpop.com and other malicious plugins and select trash icon to delete these entries. Click Reset to confirm this action and complete Search.hyourtransitinfonowpop.com removal. Here, select Extensions and look for Search.hyourtransitinfonowpop.com or other suspicious entries. Click on the Uninstall button to get rid each of them. Here, look at the Homepage field. If it was altered by Search.hyourtransitinfonowpop.com, remove unwanted link and enter the one that you want to use for your searches. Remember to include the "http://" before typing in the address of the page. Now you will see a detailed dialog window filled with reset options. All of those options are usually checked, but you can specify which of them you want to reset. Click the Reset button to complete Search.hyourtransitinfonowpop.com removal process. ^ Jon Watson. 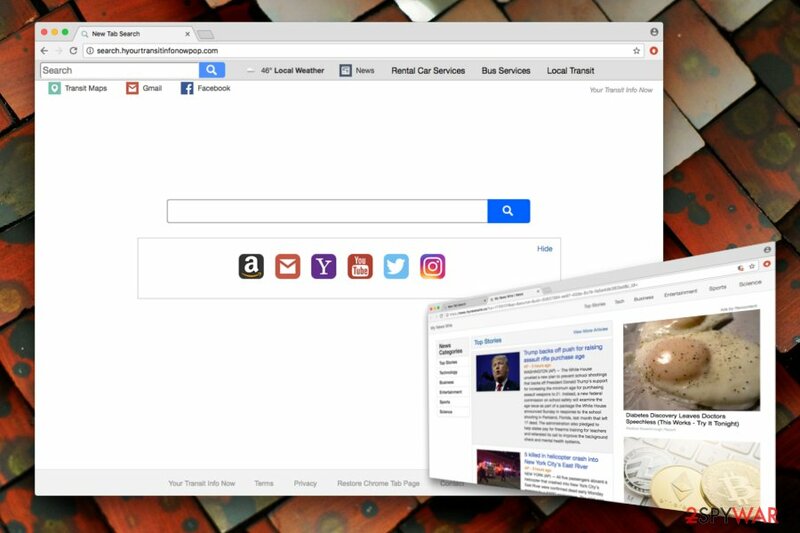 Browser hijacking: What is it and how do you prevent and remove it. CompariTech. Tech compared and reviewed. ^ What is phishing? . PhishTank. Fights against phishing. ^ Viirused. Viirused. Estonian cybersecurity experts. This entry was posted on 2018-03-12 at 09:46 and is filed under Stealing programs, Viruses. You can quickly scan the QR code with your mobile device and have Search.hyourtransitinfonowpop.com manual removal instructions right in your pocket. How did you remove Search.hyourtransitinfonowpop.com?